According to the International Southern Cemetery Gravestones Association, the best materials for gravestones include granite, bronze, stainless steel. Those materials are very durable and have good longevity. That being said, there was a time period where zinc became a popular choice for gravestones. 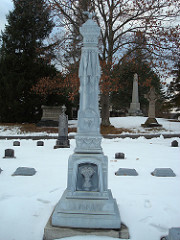 The Smithsonian points out that the Monumental Bronze Company in Bridgeport, Connecticut, (and its subsidiaries in the United States and Canada) started creating grave monuments that were made of zinc. This began in the 1870s and became a trend for a while. People purchased zinc gravestones for several reasons. Grave monuments made of zinc were less expensive than ones made of more traditional materials. The zinc monuments were marketed as “white bronze”, which made it sound rather fancy. People liked that the “white bronze” gravestones looked as though they were made of stone. The Monumental Bronze Company used a unique technology that included a sandblasted finish to imitate the mat appearance of stone. They created thousands of markers, custom-made effigies of the dead, off-the-shelf statues of Faith, Hope and Charity, and enormous Civil War memories crowned with statues of soldiers. “White bronze” monuments could be customized with scrollwork, wreaths of roses, and family names that appeared to be carved from tree branches. Plaques could be bolted onto the monument, and taken off and updated over time. The zinc monuments appeared to have been made of stone. The advantage was that the zinc didn’t oxidize from brown to green (as bronze monuments do). Zinc monuments don’t end up with lichen growing on the surface, a common problem with granite monuments. The disadvantage of gravestones made of zinc is the color. They are a bluish hue, which some people may feel is “cold”. Unlike grave monuments that were made of granite or marble, the zinc gravestones are hollow. You can knock on them and tell by the sound that they are hollow inside. Zinc gravestones are durable, but not unbreakable. The Smithsonian notes that the most common damage to zinc cemetery monuments is breakage of the brittle metal and separation at the seams where components were joined at the foundry. The zinc might become discolored over time due to metallic repair techniques such as soldering or by using epoxy or polyester resins. Some smaller zinc monuments might start to bulge when their foundations are inadequate. The Smithsonian says that people have tried to repair them by filling them with concrete to provide the lacking support. The Smithsonian does not recommend doing that – and suggests they be repaired with new stainless steel armatures instead.